Having brought versions of this program to community venues across the country, Okantah and the Quartet know how intense their multimedia performance can feel to first-time listeners. A refreshing reminder of both the unique powers and deeper kinships of music and poetry, the performance of Collage on October 14 filled the Auditorium of Pilgrim Church with sounds both tranquil and mighty. In an era when rhyming rhythmic recitation over instrumental sound hardly constitutes a new idea — hip-hop, after all, is the ascendant popular genre of the present century — Okantah and the Cavani have engineered something unique, brilliant, and vital. The Quartet, joined by guest cellist Daniel Pereira, launched into Dvořák’s Quartet in F Major (“American”) as though going about a conventional classical performance. First violinist Annie Fullard’s reverent introductory comments about the Czech master betrayed nothing of the subversions to come. Violist Eric Wong distinguished himself throughout the performance, but especially in the opening solo of the first movement and the furious fiddling of the fourth. Pereira took the opportunity to prove himself at the beginning of the second movement, and Sato, the perfect second violinist, adapted to the divergent demands of her part with ease. Fullard led the charge with a bright, commanding tone and absolute assuredness of interpretation. Okantah joined the Quartet after an intermission, and though the first piece of music on the second half was a reprise of the Lento from the “American” quartet, the tone could hardly have shifted further. 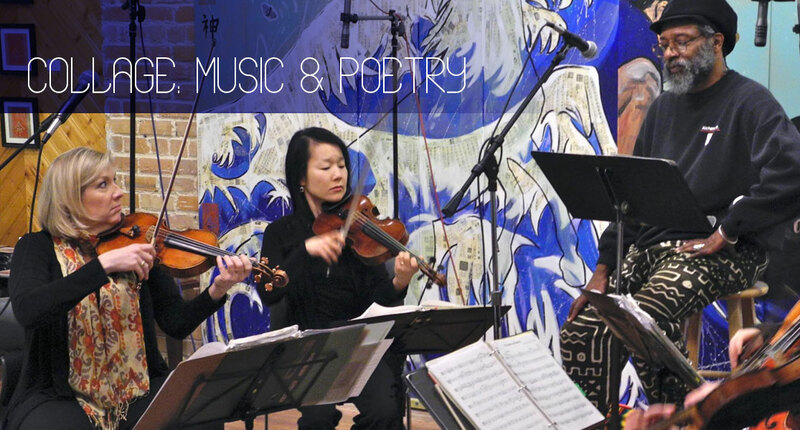 Okantah recited the program’s namesake, a poem called Collage, over a slow movement that Dvořák clearly wrote with Spirituals in mind, and suddenly, the movement’s context felt palpable. The voices of the African American musicians and poets whose work inspired the composer became audible through the spoken evocation. In a series of passages from Hughes, including the above-mentioned portion of Harlem, Okantah channeled his predecessor as the Quartet played glass-sharp movements from Bartók’s Quartet No. 4. A series of newer pieces rounded out the program, all composed or arranged with the Cavani-Okantah quintet and the poet’s style in mind. Eric Gould’s He Speaks in Shadows sounded magnificent as a companion to Okantah’s post-Vietnam reflection Homeboy, and former Cavani cellist Merry Peckham’s music for Breakfast at the Ibis conjured the isolation of the characters in the poem’s micro-narrative of marginalization. In Midnight Child, Charles G. Washington’s violin solo and walking bassline for cello sounded marvelous in Fullard and Pereira’s hands respectively, as Okantah recounted a conversation with a wise stranger in Saw an Old Woman. Pereira, Wong, and Sato sounded phenomenal in Peckham’s arrangement of the Thomas A. Dorsey hymn Precious Lord, and a line about time passing in Okantah’s accompanying Legacy lined up exactly with a tempo shift in the music. In the last of this concert’s welcome departures from the ordinary, the artists took questions and comments afterward. The listeners were audibly moved. Published on ClevelandClassical.com October 18, 2018.